Welcome to another blog hop. This time I am taking part in the FIRST Ink & Share Scrapbook Blog Hop. I live in a lovely village in near Ely in the UK. You may have just joined me on this blog hop or just hopped over from Sue and seen her scrapbook page. For this first blog hop the theme is Anything Current. Whilst I was looking through some old photos trying to find some that I could scrapbook as one off pages. I found some photos of my lovely daughter which were taken by a professional photographer for one of my birthdays. The photo has a black and red border around it and I wanted to use a bright colour for my page so I chose Real Red 12×12 card stock. I have been trying to find another excuse to use the Petal Palette stamp set as it is a lovely set. Also I wanted to use more embellishments as most of my scrapbook pages are full of photos rather than just the one photo. I decided to use the White Polka Dot Tulle ribbon and the Black Satin ribbon. By trying different layouts I decided to layer the ribbons, with the polka dot tulle on top of the black. Don’t you just love how this turned out? 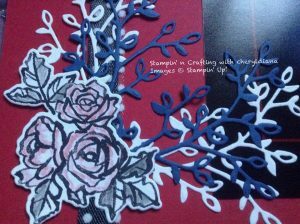 I die cut out the leaves using the Petals & More Thinlits and Whisper White card stock and Blueberry Bushel card stock. These were glued onto the left hand corners using fine tip glue. Then I stamped the flower stamps in Black Memento. These flowers were then coloured in using the Real Red watercolour pencil and a blender pen. The leaves were coloured in using the Basic Black watercolour pencil. Finally I used Wink of Stella brushed over the roses to make them sparkle. 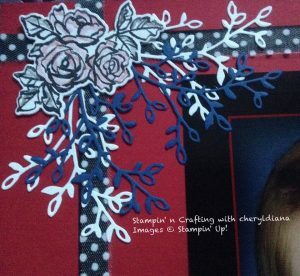 To finish the page off I used the Amazing and You dies from the Celebrate You thinlits which were die cut again using Whisper White and Blueberry Bushel card stock and stuck one over the other. I hope you have enjoyed looking at my scrapbook page and that it has given you some ideas. Please do leave comments as you hop around this blog hop. Please click on the next button to hop over to Cindy to see her scrapbook page. Beautiful layout! Love all the layering – thanks for sharing! 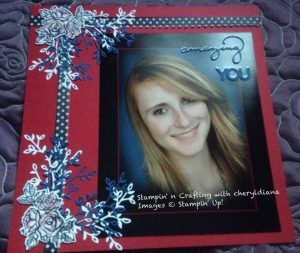 Beautiful layout to showcase your daughter! I especially love your colouring on the flowers! Great design with lots of details! Great layout! Love the floral details! Love your page Cheryl! Love how the placement of the flowers draws the eyes to the photo. Thank you for participating in our blog!